Southern Texas is a major winter destination for snowbirds or Winter Texans as known by the locals, who escape the ice, snow, and cold to enjoy winter in a warmer place. Join us in New Braunfels this winter, a sub-tropical paradise with a mild climate, warm weather and endless outdoor activities and festivals to enjoy. There are no snow shovels in New Braunfels! Warm southern hospitality and traditional Bavarian entertainment welcome you to this vibrant small town community. The boot-tapping live music scene will have you line dancing and kicking up your heels in honky tonk bars and traditional dance halls such as Gruene Hall, and or soaking-up the songs from famous Texas Bands to iconic artists like Willie Nelson at the Whitewater Amphitheater. Beer Connoisseurs can take a coach tour of the Hill Country Craft Beer Trail, sampling craft beers at 11 breweries and wine-lovers have over 46 unique wineries to visit starting at the Grapevine Wine Tasting Room in the Gruene Historic District of New Braunfels. Steeped in German traditions and Bavarian-style entertainment, New Braunfels hosts several fun winter events and festivals. View the works of potters and clay artists at the Texas Clay Festival in the Gruene Historic District in October or do some Christmas shopping at Weihnachtsmarkt, a German Christmas Shopping Market. Sample traditional sausage, strudel and potato pancakes along with true Alpine and Bavarian-style entertainment at WurstFest and drink traditional wassail, a hot mulled cider at the annual Wassailfest. There is always something to do under our warm winter skies. Explore the rich culture of New Braunfels as you head outdoors. One of New Braunfels most treasured attractions is the Natural Bridge Caverns, a magical wonderland of underground beauty. Christmas at the Caverns brings twinkling lights and underground cave shows, a wonderful way to celebrate the Christmas spirit. Did we mention too that we play golf year-round in New Braunfels? Be sure to experience some of Texas' most scenic golf courses. Follow the scenic winding River Road to Canyon Lake to play and boat on 80 miles of scenic shoreline or find a quiet spot to enjoy world-class fly fishing. Float or tube the waters of the Guadalupe and Comal River, quieter in the winter months yet still warm enough for a morning swim. Here in New Braunfels, the lakes do not freeze over and the water is warm. New Braunfels is paradise for migratory birds with over 300 species from across North America making this their chosen winter destination. Walk the many birding trails to quietly observe these birds on their migration flight path. Whether you are fly-fishing, birding, caving, boating, tubing, hiking or simply resting in the warmth of the winter sunshine, New Braunfels is any snowbird’s dream vacation destination. 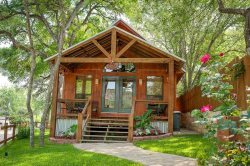 Step out of hibernation into the warmth and come to make memories in one of our beautiful New Braunfels vacation rentals.